My children used to love playing with colorful plastic blocks. Then they discovered iPad entertainment, and there was no going back. Or is there? Bloxels from Pixel Press is a clever learning toy that lets children build their own video games and characters, one block at a time. Bloxels marries the touchscreen magic that the kids go crazy for these days with the more tactile, imagination-based play that I grew up with and my children are currently ignoring no matter how hard I try to get them interested. 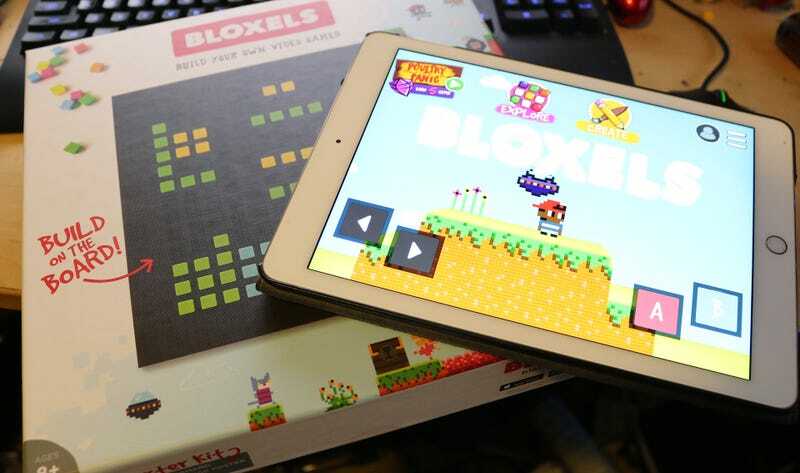 The first half of Bloxels is the starter kit, a hefty box containing 320 colored blocks, a 13 x 13 game board, a challenge poster and a guidebook to help players get started. The second half of Bloxels is a free downloadable app that players can use to create and share their own characters, backgrounds, animations and game levels. Here’s the basic idea. Using a series of color-coded cubes, players can create a basic video game screen in minutes flat. Take a look at the board I threw together below. The green cubes represent terrain. The red cubes are hazards. The one purple cube is an enemy, and the gold cubes are coins. I used no reference for this, other than the basic information presented on the Bloxels box. With a little tweaking, replacing the background and some of the textures via the app’s intuitive interface, it looked a little better. Say you want your own character. Using copious amounts of yellow and a bit of white and orange, I made this duck. He is the best duck. I had to fiddle a bit with the camera angle in my darkened office (again, lighting), but eventually my pixel duck became a real pixel duck. I could go into the character editor and create walking, jumping and idle animations. I was the lord of digital ducks. Then I went into the sharing center and spent some coins to purchase another player’s Pikachu, because he’s a bit better than ducks. Creating and sharing is rampant in the Bloxels community. It’s sort of like a 2D Minecraft, only in 3D . . . you know what i mean. With a 3D physical element that makes inquisitive kids get all creative, or at least creatively recreate existing properties. With patience and the sort of vision younger children seem to have in spades, it’s possible to create an entire game with Bloxels, consisting of 16 rooms filling with traps, story bits and more. They can create the entire thing from scratch, managing each background, terrain element and character, or trade assets with other players to create the perfect mix. My sons, both five, are currently desperately waiting to get their hands on the Bloxels set. Seamus, the real tech buff of the two, was begging me to open the box once he noticed the iPad on the cover. I figured I’d share it with you before all the blocks ended up under the couch. Thankfully the game is rated for children 8 and up, meaning I’ve got days until they find it in my office and start playing anyway. The Bloxels starter kit from Pixel Press and Mattel retails for $49.99. The app is free on iOS, Android and Amazon.